The octagonal shape is ideal when using the reflection method of light distribution. As a result, the Octa Bank gives remarkably even illumination – within 1/3 f/stop – across the entire 6ft plus diameter. It can be used very close to your subject for soft, even wrap-around lighting effects, and its light efficiency allows even the smallest compact units to give impressive exposure readings. 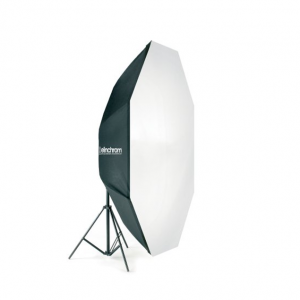 Elinchrom light banks are optically matched to Elinchrom heads, providing unsurpassed evenness and efficiency in a large size. The Octa is also supplied with a durable carrying case for protection and portability.